The Land Transportation Office (LTO) has issued a new memorandum dated February 23, 2017. This new memorandum, which was made available to us, deals with the standardized temporary plates as well as the No OR/CR, No Travel policy. Addressed to all LTO accredited dealers, this new memorandum signed by LTO Assistant Secretary Edgar C. Galvante delays the use of the standardized temporary plates from February 15, 2017 to June 1, 2017. This means that all vehicles released from June 1, 2017 onward will be required to sport the standardized temporary plate with a prescribed format that includes information such as the Conduction Sticker number and Motor Vehicle (MV) File number prior to their release or delivery to the owner. While this gives reprieve to all accredited vehicle dealers nationwide to secure a supplier for the standardized temporary plate, the same memorandum also reiterates the implementation of the No OR/CR, No Travel policy which is in effect. Therefore, dealers may require their customers to either take delivery of their vehicle only when the OR/CR has been made available or sign a waiver releasing the dealer of any claims/damages in case the driver or owner wants to bring his vehicle home when the OR/CR is not yet available. It’s also worth noting that though vehicles released before June 1, 2017 need not sport the standardized temporary plate, it would be a good practice to indicate the MV File Number in your temporary plate in a clear, legible manner to avoid any potential hassle. 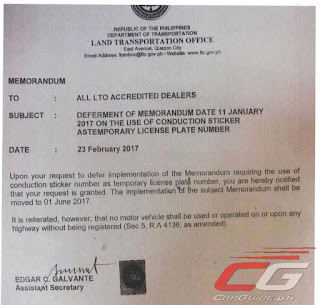 Upon your request to defer implementation of the Memorandum requiring the use of conduction sticker as temporary license plate number, you are hereby notified that your request is granted. The implementation of the subject Memorandum shall be moved to 01 June 2017. It is reiterated, however, that no motor vehicle shall be used or operated on or upon any highway without being registered (Sec 5 R.A. 4136, as amended). As per the memo it said "without being registered" does it mean u can bring ur car on the road because technically speaking it is being registered. Is that right? Proof of registration is the OR/CR. without certificate of registration dapat. may point yung nag comment. basta nasa LTO na it is being registered. Mam/Sir hingi po kayo ng transmittal sa dealer nyo, yan ang proof na napadala na ni dealer kay LTO ang mga requirements for registration. Sir Ulysses, I just bought a car last week and OR/CR still pending. Ano ba ang definition ng LTO sa "highway"? If I'm assuming it correctly, sa highways ko lang hndi pwede gamitin ang car with no OR/CR, so pwede ba sa mga small roads? Thanks. mga boss kailngan ba iparenew ang motor kapag wala pa ding hawak n plate number isang taon n dn kasi itong motor. Mga ilan days ba yung processing ng or cr? Paano ba malaman kung inasikaso ni dealer yung or cr? Depende. Ang sabi ng LTO kaya daw ng 3 to 7 days lamang, sabi ng mga dealers dahil sa backlog umabot ng ilang buwan. My agent promised me 2 to 3 weeks to get the or cr / however she was able to managed it for just 7 business days. You can follow up always to your agent for the updates. Hi Sir Uly, our car was released late December 2016, yet our ORCR is still not available according to the dealer. We were promised that the ORCR will come out after one month, but it is already more than 2 months. What can we do? We have been following up for weeks. Thanks. Malamang dealer na may problem dyan, I acquired my car Feb 8, come Feb 24 I already got my OR/CR I got my Montero from Mitsu San Fernando, mabilis sila. My unit was released late December 2016 and until now wala pa din yung OR/CR ko. Saang dealership mo nakuha unit mo? Ako sa Toyota Alabang. This rule is really to avoid batch processing of dealers of papers, I can attest to this since my papers were submitted last Feb28 and date of my OrCr is March 3 so LTO cam really process registration within 3-7 days. Got my unit 3-6-17. I was insistent with my dealer that I won't receive unit until registered. Instead of signing a waiver I passed the pressure to them to submit my papers without delay. My dealer Submitted my documents Jan 6 2017 and OR/CR released Jan 16 2017. Ei ung plate sticker. Kelan kaya ang release... 2013 pa ung last sticker ko.bayad 2014-2017 pro walang sticker. Hi. Kung nastencil na yung engine and chassis number, sa tingin nio po gano pa po katagal bago ilabas ung OR/CR? Thanks.. There are factors that causes the delay of the OR CR. One would be the submission of the TPL. Some customers have their own insurance. Their insurance company sometimes doesn't submit the original COC on time. They just send it for the meantime thru email so that dealers can release the vehicles. Second would be typo errors made upon verifying the authentication no. Also I would like to comment i just read regarding the availability of the OR CR of which one person received his OR CR within 2 weeks at mitsubishi. Yes its true its faster getting it. But first, try to analize it. Which would finish faster to process the OR CR (LTO plus PNP CLEARANCE). A toyota dealer who sells in a MONTH 450 units compared to 150 units a MONTH by other brands. Obviously, the lesser volume would be faster. Most of the dealers offers free LTO, CTPL and etc. So this factor is very less likely to cause the delay in the registration. The dealers should not use their big sales volume as an excuse for the delay in registering the cars they sell. Why not do the registration on a daily basis? Why wait for a month? Question lang po. Regarding po sa no OR/CR no travel. Papano ung bagong bili lang. Meaning hindi talaga nya mailalabas ng Dealer ung car na walang OR/CR. just sign a the waiver na you would bear all the consequences / penalties if you get caught by traffic police or by the LTO then pede mo na iuwi yung car mo at itago sa loob ng garage mo until maibigay sa iyo yung OR/CR mo. Stay away from Toyota Alabang. They are the worst dealer when it comes to OR/CR release. Many of its customers are complaining day by day due to the delay in releasing the OR/CR of their customers. Ang Toyota Manila Bay kaya mga boss? Any feedback kung mabilis nila nalalakad ang OR/CR? Is it true na matagal talaga ang stock report ng oto pag manufactured abroad? Can i demand the dealer to keep the car with them until it is registered? Would that be better than stocking it in my garage (exposed to sun, dust and cats) ? Any highway lang ang restrictions? So pwede sya sa mga ordinary road? too keep it plain and simple, you can only use the car inside a subdivision, garage, or private roads(e.g. you own that road w/c is quite impossible). Public roads, highways(EDSA, NLEX, SLEX, C5 etc.) are not allowed. siguro by this time meron na yan. ano po sinabi nyo sa email. gagawin ko rin po yan. thank you! Ano pi sinabi s email. Currently sabi po ng dealer na kailangan n daw ng username ng every dealer para makaregister ng bagong sasakyan. pag a year ago na po ang nakalipas pero wala pa din ung plate number kailangan na po ba irenew un sa LTO? sir, advise naman po. Balak ko kasi bumili ng oto sa Aug. paguwi ko jan sa atin, dapat po ba iparehistro ko under sa name ko o sa name ng kapatid ko na jan lng po sa pinas, kasi dito po ko work sa UAE? Di naman po off-topic, para lang po malaman ko kung pano gagawin kung gaano katagal ang process ng or/cr, para paguwi ko magamit ko naman kahit sana papano. Kung tatawid lang po ako ng Commonwealth at tagos na sa mga subdivision, okay po kaya iyon? Paano kung di ayon sa standard ni LTO yung binigay ni dealer na plate? Magkaka-penalty ba ako o si dealer lang? Tanong lng po mga kaka-receive lng ng OR/CR (May-June 2017), ilang days/weeks po waiting time bago nyo nakuha ang OR/CR? Yung samin kase 3 weeks na wala pa din. Thanks in advance sa sasagot. Tanong lang po. So hindi pwede gamitin ang vehicle kahit may Certificate of Stock Reported na galing sa LTO? I was told by my dealer na ipakita ang Certificate pag nasita, tama ba? Kaya ka nga bumili ng Kotse para magamit agad dahil sa layo ng trabaho at daming sakay kapag commute at time consuming dahil sa traffic maaga ka aalis ng bahay darating ka ng late na halos pagod na pagod ka na at mapupuyat ka sa konting oras na lang ng tulog mo. Sobrang hassle yang ginawa nila na implementation na yan ng LTO. Ask ko lang sino ba ang manghuhuli kapag ginamit mo yung Car ng wala pang OR/CR? Paano nila malalaman? though may temporary plate no (Conduction No.) and nakalagay na registered? I think yung MV File Number dapat naka indicate sa Temporary plate ng koche mo..
^ correct. Dapat may MV file number. hi po pede po bang peronal na mag apply ng OR/CR? hingiin lang requirements sa dealer tpos personal nang pupunta sa LTO? Mandatory na dealer ang maglakad ng registration kasi sila lang ang may accreditation galing as LTO para maging dealer ng brand-new car o motorcycle. Hello po. Ask ko lang po. Sabi kasi nang tatay ko, pwede ko na daw gamitin ang MC kahit for registration plng daw. Kaso accdg to research e hindi pa pwede. Pwede ba gamitin ang MC sa Ayala kahit Invoice at Certification to travrl from the dealer lang ang hawak? Kasi as basis public roads and highways so meaning SLEX,NLEX, C5 and EDSA lang ang hindi pwedeng daanan nang mga wala pang ORCR? Nakalagay din po sa ceetificate na inissue ng Motortrade is "still processing the registration"
Pwede kang i-technical ng pulis kasi labag sa batas ang pag gamit ng sasakyan na hindi rehistrado. Pang kotse kasi, maaring gamitin lang ang sasakyan mo para dalhin galing sa casa papuntang bahay. After that, kailangan mong hintayin ang papeles niya tulad ng OR/CR. Ang ibang pulis / MMDA, pumapayag sa Certificate of Stocklot, PNP Clearance, at kopya ng invoice. Pero pwede ka pa rin hingan ng ibang papeles. I would suggest sana to follow up yung papeles mo sa dealer at makuha ang OR/CR ng motor mo. Unfortunately, yan lang talaga ang mahahawakan mo until dumating yung OR/CR mo. Pwede ko po ba i-expedite ang processing ng registration kahit nakapirma ako nang waiver na aabutin ng 120days ang orcr? Pwede ko bang iforward sa DTI ang concern kung hindi ako makahintay ng 120days? I don't understand why the dealer will take 120 days for the OR/CR to get processed. I'm not sure you can bring this as a case to the DTI. You can try given dapat 7-14 days lang ang release ng OR/CR. I just bought a new pickup truck at Isuzu Commonwealth. Does anybody experienced long delays of getting Or/CR from that dealer? Sir Uly, good day po! Paano po kaya maka-kuha ng Virtual Plate or Conducation No. for a diplomat car, that was sold second hand? Please help po, thank you very much in advance. Question lang po, my or/cr na photo copy ang aking motor, kailangan pa ba yong authorization letter from lto para magamit ko sya sa malayuan. Thanks po. Question.. need ko na ipa rehistro ang kotse ko this year pero wala parin ako plaka. anu po susundan ko? sabi sa akin ng dealer is kung kelan daw na rehistro un kotse un daw un buwan na susundin ko pag pianrehistro ko.. or dapat ko ba sundin un last digit ng conduction sticker ko? Hi sir good morning to LTO,ask KO lang po kailan ma release ang plate number nang mga sasakyang model 2015? Isa pa po ilang beses po ba dapat iparehistro ang sasakyan Kong 3 years na sakin. Ask ko lang po...4 months na hindi parin binibigay ng kasa ang OR/CR ko san po ba pwede ireklamo ang ganito? 2019 na... Any updates regarding no-plate, no-travel? Kalalabas lang kasi ng aming sasakyan last 2-Feb.-'19 at ang sabi ng dealer ay suspended daw ang apprehension sa mga bagong sasakyan. More like No OR/CR, No Travel ang policy ngayon. Avoid long trips muna for now if wala ka pang OR/CR.